Ooooo whee, friends, I have some juicy news bits for you! But first, we’re going to talk about the under never used carrot top! Have you ever bought carrots from either the grocery store or farmer’s market, and not known what to do with the carrot tops? They may have even offered to chop the tops off for you. I’m here to share with you that it is, in fact, edible, AND there are actual culinary uses for the humble carrot top! Do not be frightened with the prospect of pesto either. It’s so quick, you’ll spend more time digging out your food processor than getting the ingredients ready. Ok, maybe not that fast, but it’s still lightning swift to prepare. 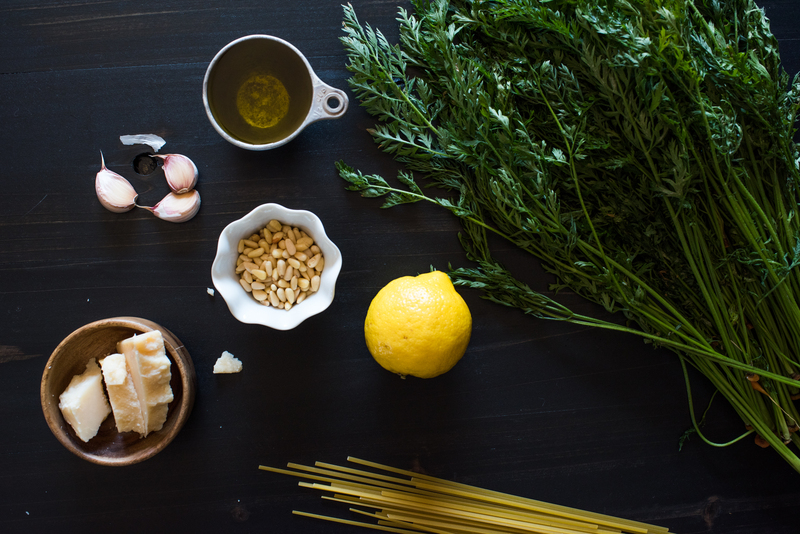 Start boiling water for the pasta, then toast the pine nuts while you prepare the other ingredients, put them in the blender, and whizzzzz! These carrot tops came from my garden, where we finally had our first harvest of veggies. Beets, carrots, kale, and lettuces were all getting along in the box together. It’s so rad to plant seeds, and watch them grow before your very eyes! To pick them, wash them, and eat them – it’s a full circle. I always feel so nourished, both body and soul, when I grow my own stuff, then get to eat it. If you ever have a hankering to do so, it’s super easy! Get a box or a bucket, some soil, and plant those seeds. Make sure they get plenty of sun, and water as per the seed packet directions, and the miracle will happen for you too! Regardless of how you obtained them, you’ve got carrot tops! For this dish, they are really the star, but you can mix up the other ingredients too. If you don’t have pine nuts, you can use walnuts instead. No parmigiano reggiano? Use another dry cheese like asiago or manchego. 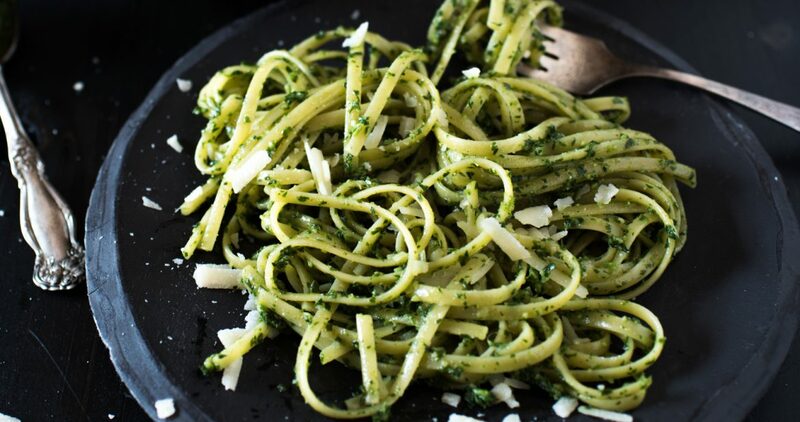 Either way, this pesto is delicious. It’s more grassy than the fragrant and minty basil, but equally delightful! So, the big reveal time is here, and I am so excited to share this news with you: The Devil Wears Parsley is an official business now, and I couldn’t be more thrilled or scared shitless! It all started with a brilliant re-branding of The Devil Wears Parsley, which has led us to this very moment, where I’m finally a new Business Owner in Moreno Valley, CA. Plans are to continue to concoct rock-n-roll recipes for YOU and brands (hit me up! ), and create digitals and tangibles to share with you too. Things will go along as they always have right here, with new recipes, and articles about DIY and my cute kids, but I want to bring even MORE edgy cool stuff to you, and inspire you to rock out in your kitchen, feeding our bodies the freshest of foods, while indulging in a refreshing brew. The tangibles will be available in my new web store. 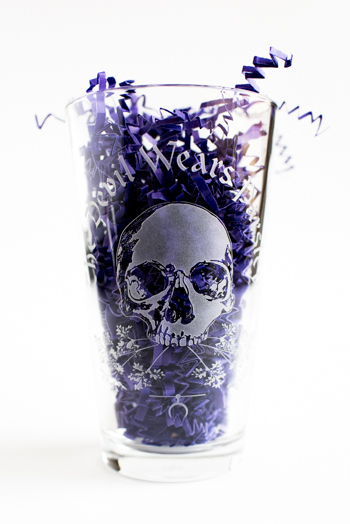 We’ve got sturdy pint glass etched with my new design for all of your standard libation needs, AND for the IPA drinkers out there, a glass worthy of the gods – the Spiegelau, also etched. The IPA glass itself was the collaborative work between breweries Sierra Nevada, Dogfish Head, and German fine glass makers, Spiegelau, but this one is donned with the new BADASS design. 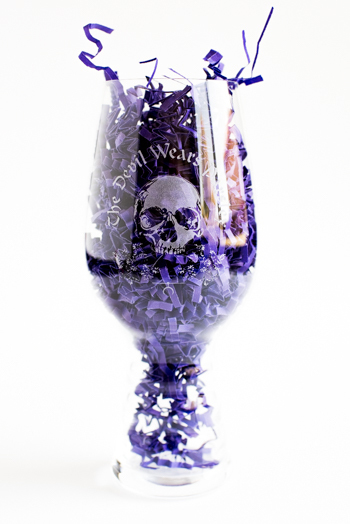 You can read all about both of these glasses in the store, and even pick up one for yourself if you’re so inclined, and bring a little rock -n- roll into your kitchen! Things in the works are some wicked tees, and what I’m really most excited about are meal plans to make your weekly meal planning effortless. So keep your eyes peeled for that headbangin’ goodness. Are you guys excited about that?! I know I am! Don't throw away your carrot tops! 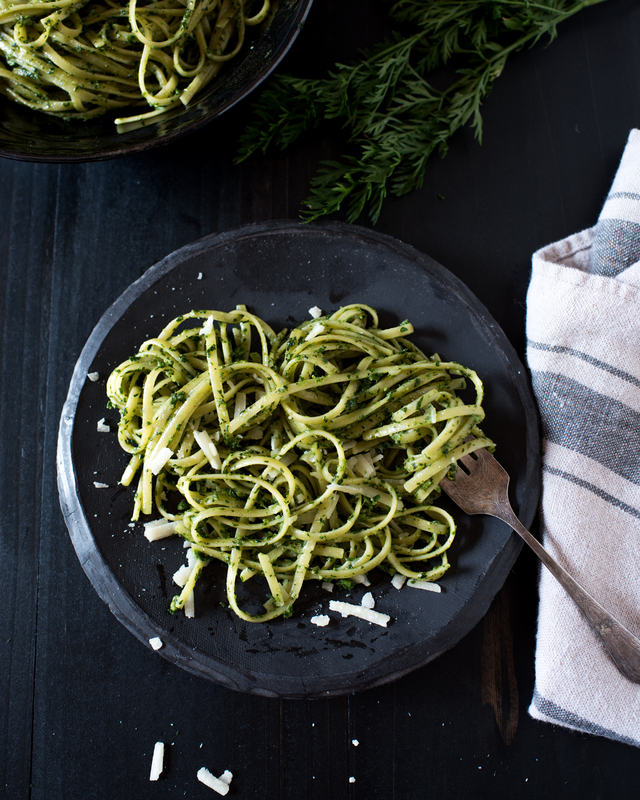 Make this pesto instead. Fill a large stock pot with water, cover, and bring to a boil over high heat. Heat a small pan over medium-low heat, and toast the pine nuts, tossing every 30 seconds so they don't burn. Once they're golden brown and nicely toasted (about 2-3 minutes) add them to the food processor. While the pine nuts are toasting, rough chop the carrot tops, just so the food processor has an easier time with them. When chopping, start at the top of the carrot top, and work your way down until there are no more leaves, leaving the stem. Don't worry if you get some stems in there, they'll be pulverized by the food processor. Also, make sure to pack the carrot tops when measuring. Add to your food processor along with the pine nuts, garlic, salt, pepper and lemon juice. Run the food processor for 10 seconds, scrape down the sides, and run for another 10 seconds. At this point, everything should be finely chopped. If you see any stems that are persisting, take them out. They lose. Place the top back on the food processor, and with it running, slowly drizzle in the olive oil. Stop the food processor when that's done, and add the grated cheese last. Pulse 3 - 5 times just to combine the cheese with the carrot top mixture. Once the pasta water is boiling, salt it with a good amount of salt (1-2 Tablespoons), add the fettuccine, and cook as per package directions. Before you drain the pasta, reserve 1/4 cup of the starchy pasta water. 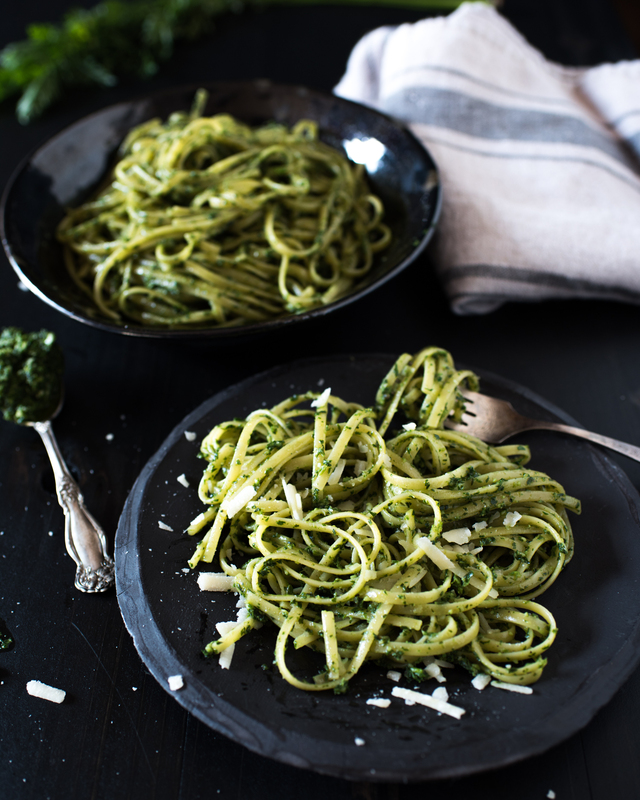 Return the drained noodles back to their original pot, and add 1/2 cup of your prepared pesto. Toss well, and add the reserved pasta water in increments if you like it a little creamier. Divide among four plates, top with a couple extra sprinkles of Parmigiano Reggiano, and serve! You'll have about 3/4 cup of pesto left over for sandwich spread, an addition to hummus, a double batch of pasta, or whatever you like! Congratulations on your new business! How exciting. 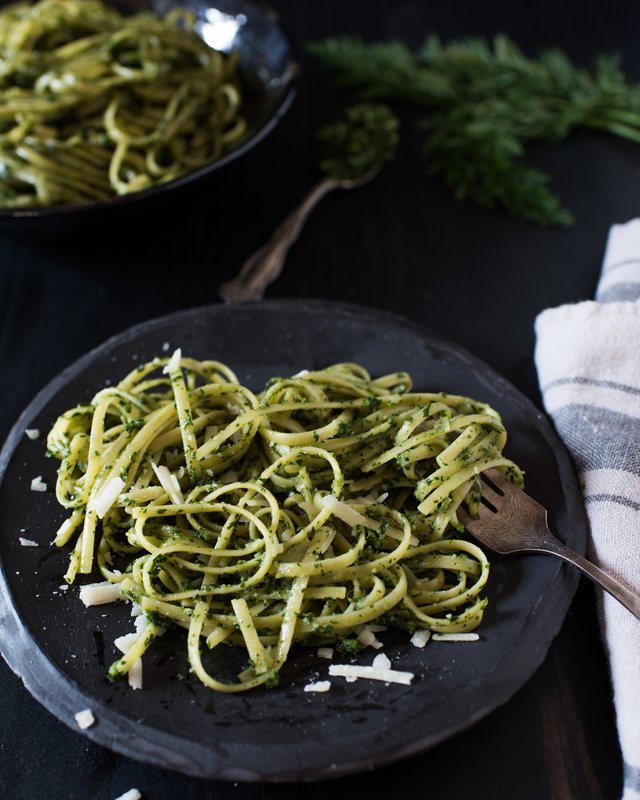 Love your idea of using carrot tops for pesto! Congrats on the amazing new store and products – perfect, of course! Can’t wait to see what you have in store for us with menu planning, you are always an inspiration. 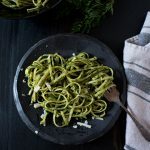 Love the carrot top pesto ~ I made some not too long ago and it was deliciously different – I’m with you on using as much of our produce in or cooking as possible! I just LOVE that this recipe uses carrot tops. I have never known what to do with them and so have always guiltily thrown them out. I will definitely be trying this one! P.S. Congrats on the store, such a huge achievement! What a fabulous idea! I love new pestos and trying new things. This looks amazing! I agree with you 100% on using as much as we can in the kitchen.